Honorhall Orphanage is located in the southern part of Riften. It consists of one zone, Honorhall Orphanage. It houses four orphans and is run by the generally despised headmistress, Grelod the Kind (an apparently self-given nickname). Grelod's meek assistant, Constance Michel, lives in the orphanage as well. A fifth orphan, Aventus Aretino, whom you encounter in the quest Innocence Lost, lived there temporarily until running away. Installation of the Hearthfire add-on allows you to adopt orphans from Honorhall Orphanage. With Hearthfire installed, the death of the parents of a child will cause the child to be relocated to the orphanage. The entrance is to the west of Mistveil Keep. You enter into a reception room with two benches on your right and a dresser in front of you, with the door into the dining room to the left. On the dresser there is alto wine, wine, and Nord mead. There are two barrels to the left of the entrance. In the dining room there are two long tables with benches either side holding a salmon steak, grilled leeks, a baked potato, two raw potatoes, a cabbage, two loaves of bread, and a goat cheese wedge, and a food barrel in the northwest corner of the room. There are two doors to the west and a doorway to the south of this room. The doorway leads into the main bedroom for the children, and contains five beds, three chests, and a fireplace with a cooking pot in front. There is a door to an enclosed outside area to the east and two double doors in to the south. 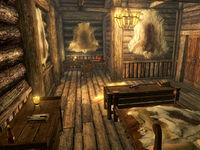 The one on the left is Grelod's bedroom and contains a double bed, a wardrobe, two end tables, a dresser, and a table and chair. On the end tables is a sweet roll, a bottle of wine, a sample of lavender, a copy of The Woodcutter's Wife, and a copy of The Bear of Markarth. 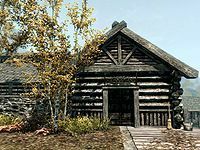 On the dresser is a bottle of Nord mead, an iron dagger, and a copy of The Cabin in the Woods, with a pair of boots beside it. On the table there is a bottle of wine, a ruined book, a wooden plate containing a seared slaughterfish, a potion of minor healing, and two coin purses—one medium, one large. The second double door leads to the punishment room, a small room containing three sets of shackles. The two doors off of the dining room lead to Constance Michel's bedroom and a storeroom respectively. Constance's bedroom contains a dresser, end table, and a single bed. There is a wooden bowl containing a red, blue, and purple mountain flower on the dresser, a bottle of alto wine on the end table, and a copy of the Sneak skill book Purloined Shadows on the floor between the end table and bed. The storeroom contains a cupboard with a bowl of bonemeal on top, a large shelving unit holding five potatoes, two loaves of bread, a cabbage, three eidar cheese wheels and two goat cheese wheels, various sacks on the floor, a barrel and a small table, with a basket of potatoes between these. On the table are four potatoes, a gourd, a loaf of bread, and bottles of alto wine and Nord mead. There are three rabbits, two pheasants, three garlic braids, four dried elves ears, and three frost mirriam samples hanging from the ceiling. The punishment room is mentioned in Runa Fair-Shield's dialogue: "I hate her. Everyone hates her. She's the meanest person I ever met. Sometimes she even locks us in the... room." If more children become orphans after Grelod's death, her room will be transformed to contain six beds which the new orphans sleep in randomly. Based on his dialogue, Aventus Aretino is supposed to return to the orphanage after the completion of the Innocence Lost quest. However, he remains alone in his Windhelm home long thereafter. Esta página foi modificada pela última vez à(s) 02h09min de 28 de setembro de 2015.